Unwrapped 2015 – Preparations Are Well Under Way! UNWRAPPED is an annual winter celebration. 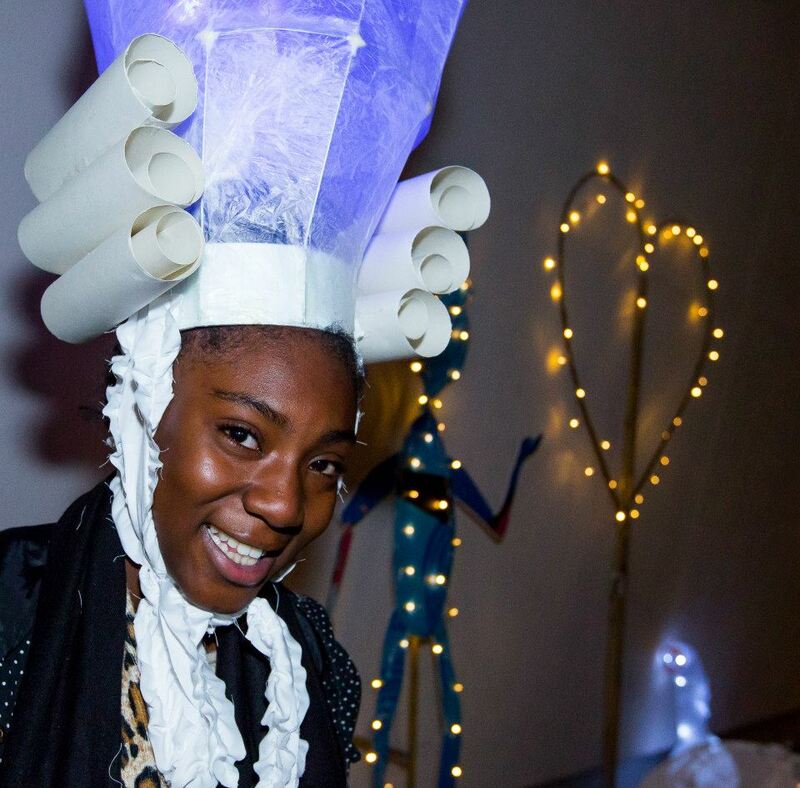 Children, young people, and communities of all ages join professional artists to “unwrap” the festive winter season through a combination of music, performance and visual arts. a time of the year when anything can happen. The Wren Boys, a group of magical travelling players, come to town and conjure up a Christmas spirit. Setting out on an adventure accompanied by 6 Reindeer and a cheeky spirit called Puck, they meet Jack and Jill Frost along the way and awaken an icy Snow Queen. 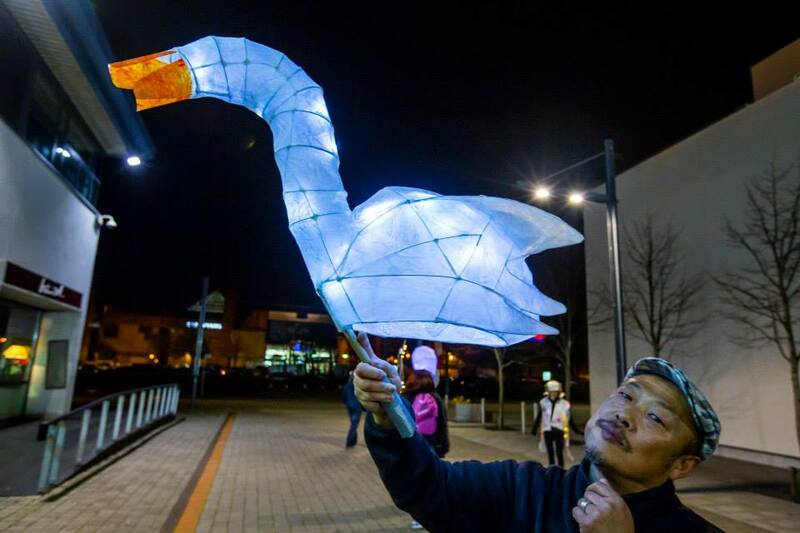 Hundreds of costumes, props and decorations are being made for Unwrapped 2015 by artists Tadashi Kato and Dee Pouch, who are working in Tallaght Community Arts Making Space. 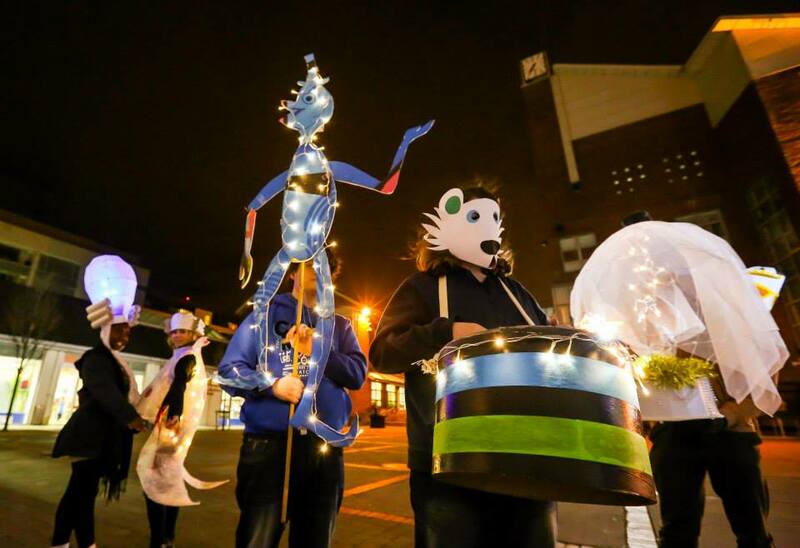 Over 200 children, young people and adults from South Dublin County’s youth, school, disability and community arts, performance and music groups will be participating in this years performance. 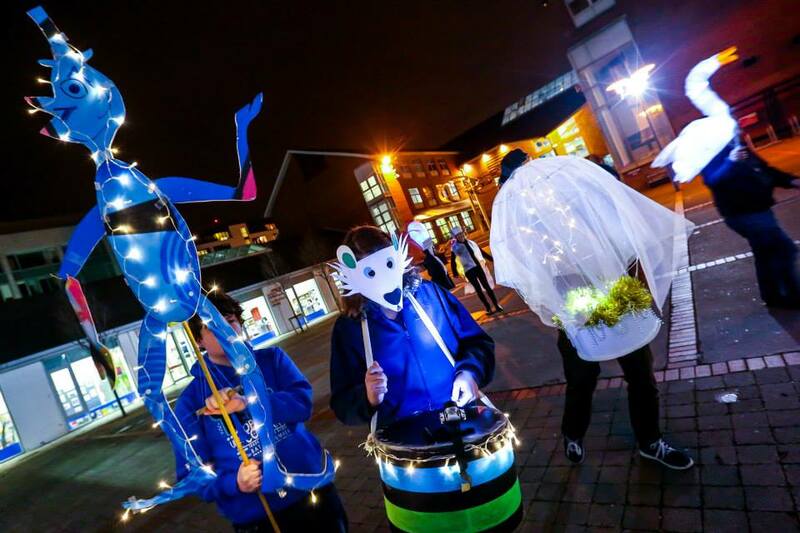 Unwrapped 2015 happens on Saturday the 5th December 2015 at 4.45pm in Chamber Square outside the County Library, Tallaght. It is a family friendly event, and free to all to attend. Unwrapped ’14 is coming soon! Unwrapped ’14 takes its theme from the carol Good King Wenceslas and will feature an exciting array of local talent of all ages. 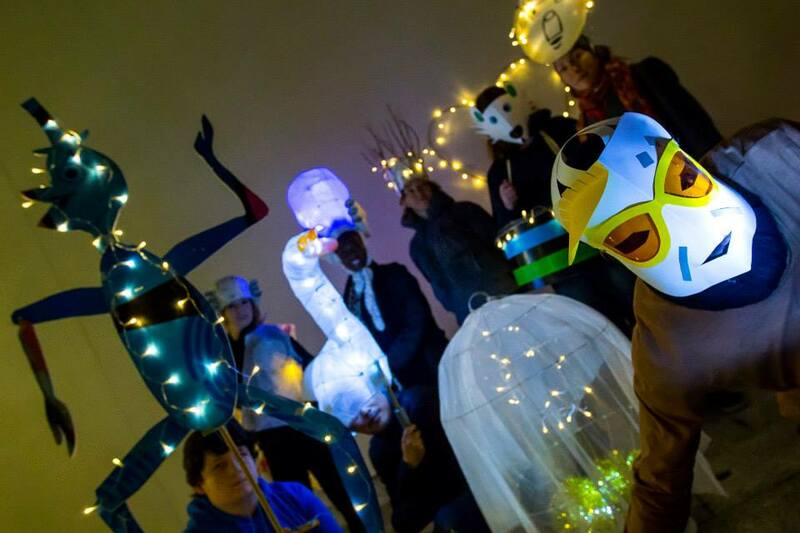 A team of artists will create an event with vivid characters, music, and performances involving an epic journey through a winter landscape that takes the audience on a journey into the heart of what the festive season can be at its best. 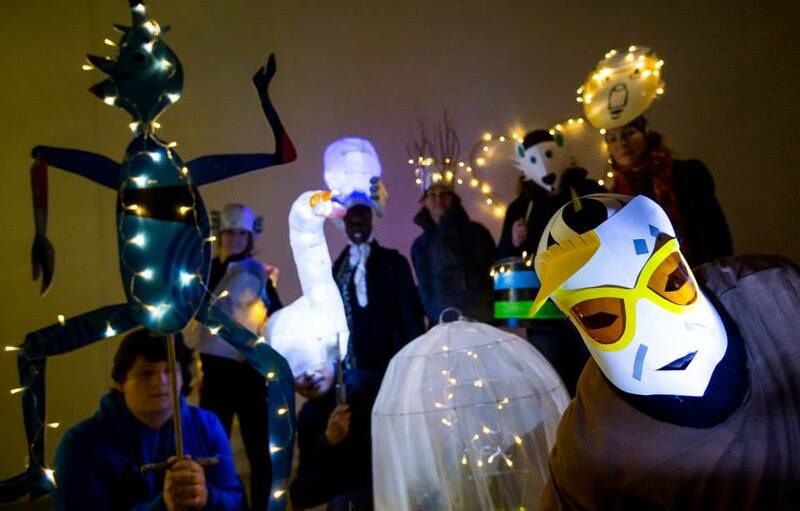 Unwrapped is an artist led intergenerational participatory arts winter celebration combining performance, music, and illuminated and figures. 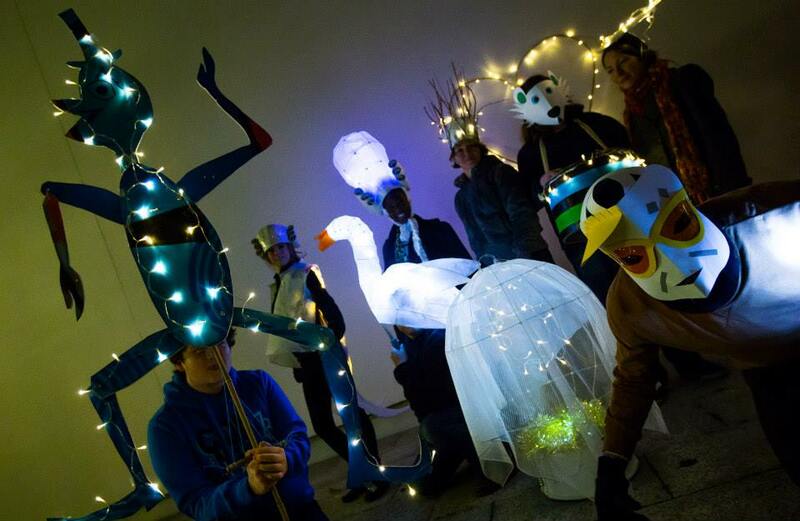 Unwrapped involves children, young people and adult members from the wider South Dublin County communities in an imaginative and exciting live event that animates the County Library, Civic Square, the Civic Theatre and RUA RED and culminates in the official lighting of the County Christmas Tree by the Mayor. 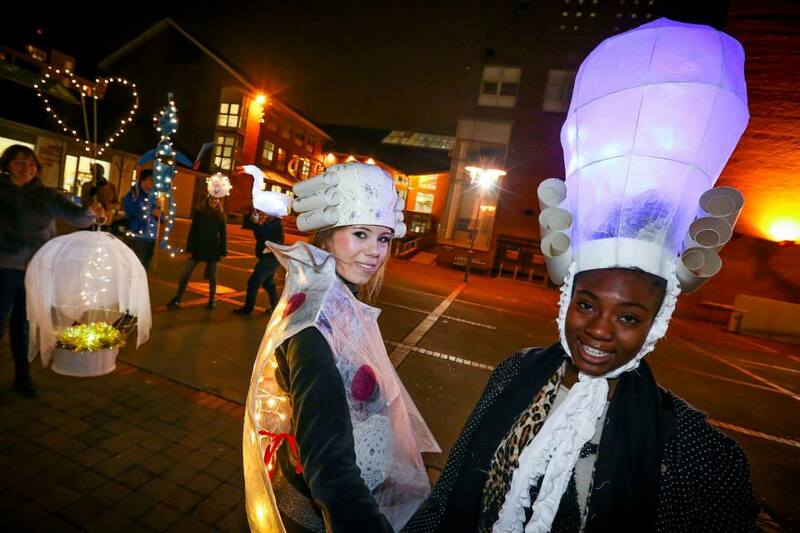 Now in its 5th year Unwrapped ’14 is a perfect family friendly start to the Festive season! 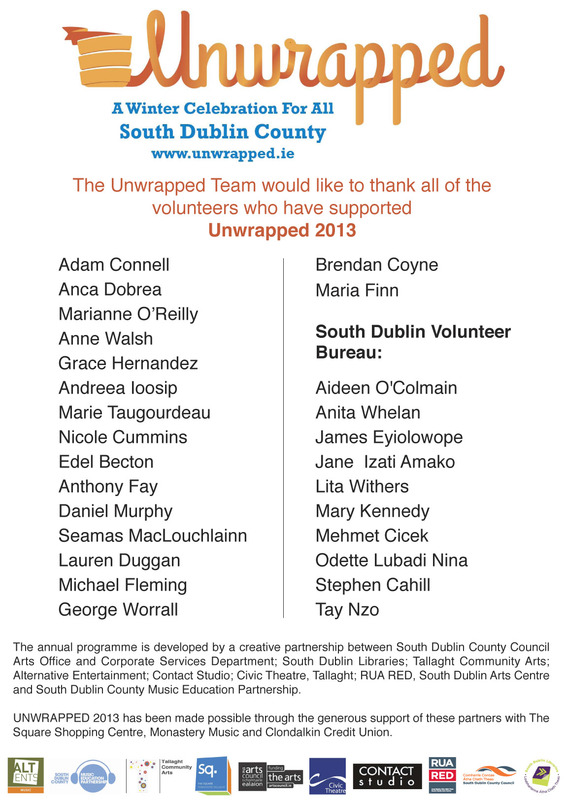 Thank you to all the volunteers helping us with UNWRAPPED 2013! See what’s in store tomorrow! 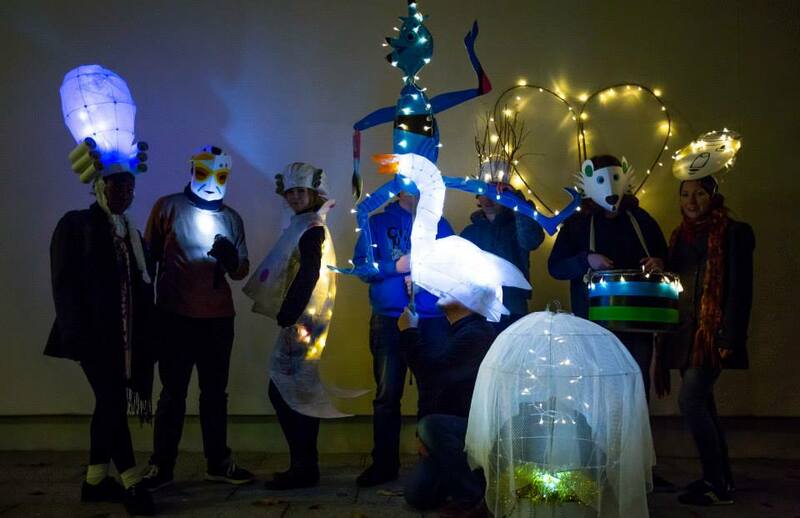 Meet Macushla Dance Club–our French Hens! The Macushla Dance Club is a dance club for the +50s and they are taking part in UNWRAPPED 2013 as our French Hens! Macushla Dance Club provides access to dance for older people, develops links between older people and the professional dance community, and promotes performance opportunities for older dancers – supporting older people’s contribution to Dublin’s vibrant and diverse dance scene. Since its establishment in 2007 by dancer Ríonach Ní Néill, it has collaborated with professional choreographers on 3 dance theatre works and 2 films, the latest, The Area, which will be premiered at the Lincoln Center, New York. All are welcome to the free drop-in dance classes on Thursdays 12-1pm, Dancehouse, Foley St, D1. The Macushla Dance Club is supported by Dublin City Council, Dance Ireland, Impact & Go for Life. 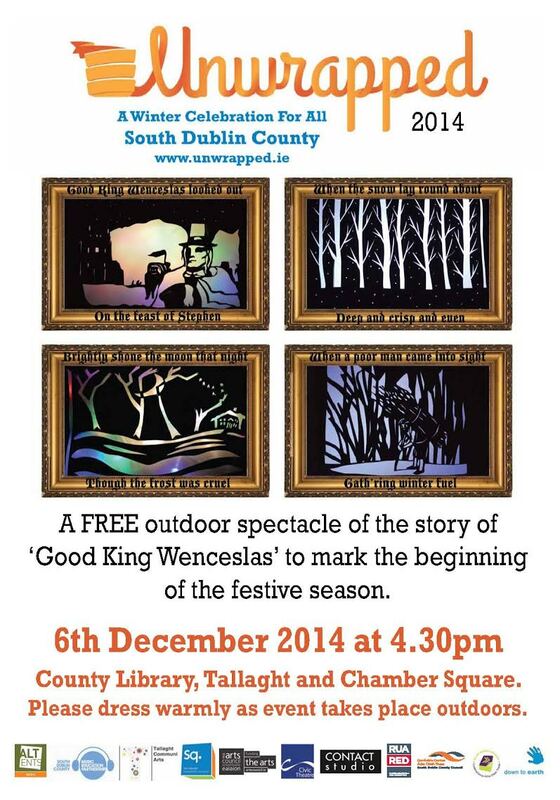 Unwrapped takes place Saturday 7th December @ 3.45pm. Get a peak at UNWRAPPED at The Square Shopping Centre! 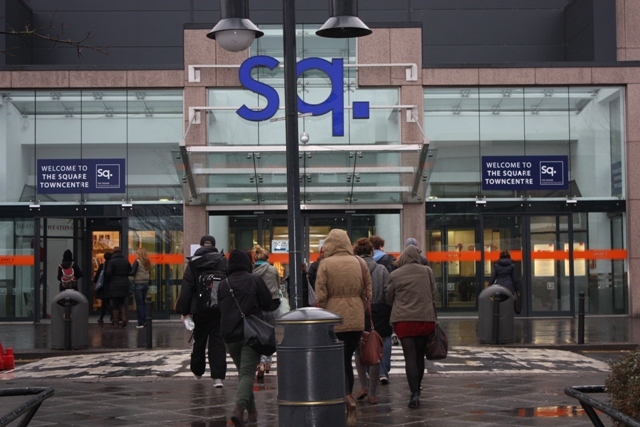 The team behind UNWRAPPED is delighted to have the sponsorship support of the Square Shopping Centre for the 2013 event. 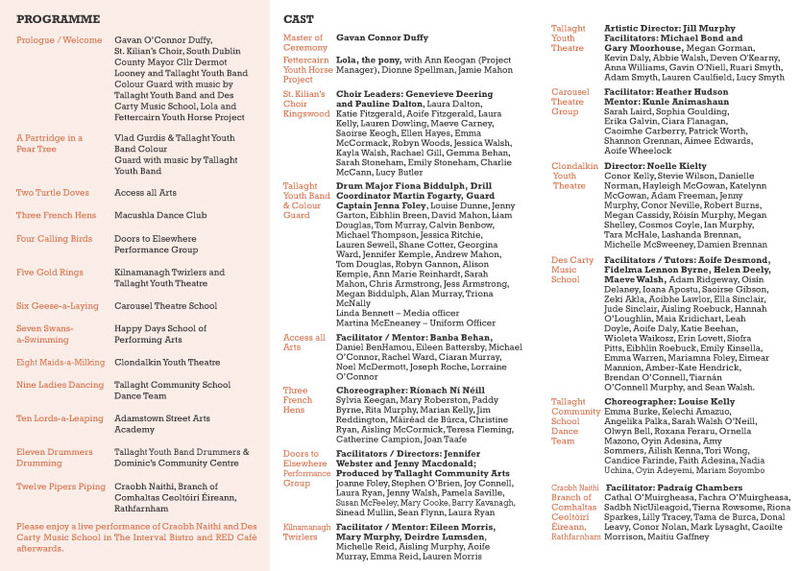 This means some exciting additional events in the run up to our big programme on December 7th. On November 30th, the Des Carty Music School with the support of Alternative Entertainments and Monastery Music will be performing from 1 – 2pm. Come along and enjoy some Christmas and traditional Irish Music by some brilliant students. You’ll see them performing new music at UNWRAPPED 2013 composed by their teacher, Aoife Desmond. On December 4th from 7:15pm the 9 Ladies from the ’12 Days of Christmas’ song will promenade through the Square along with some of our 11 drummers drumming! Thanks to Tallaght Community School Dance Team and Tallaght Youth Band for taking part! 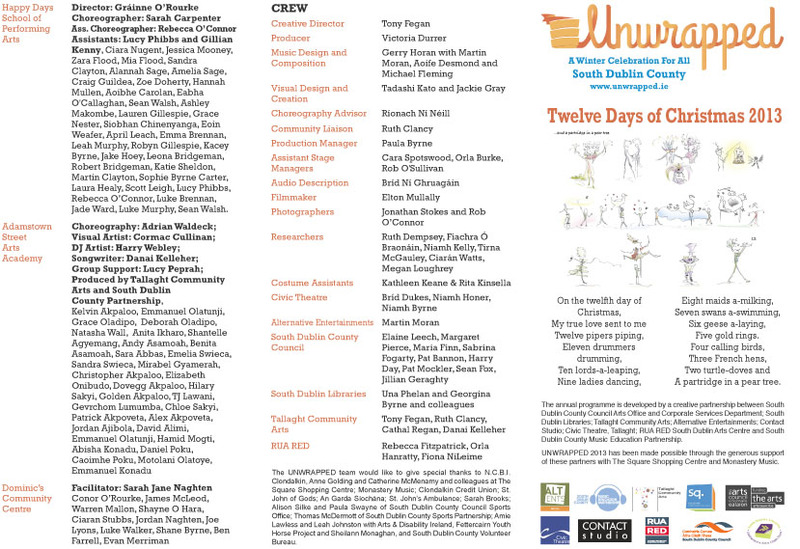 UNWRAPPED 2013 would like to thank The Square Shopping Centre for its generous support of this year’s programme. 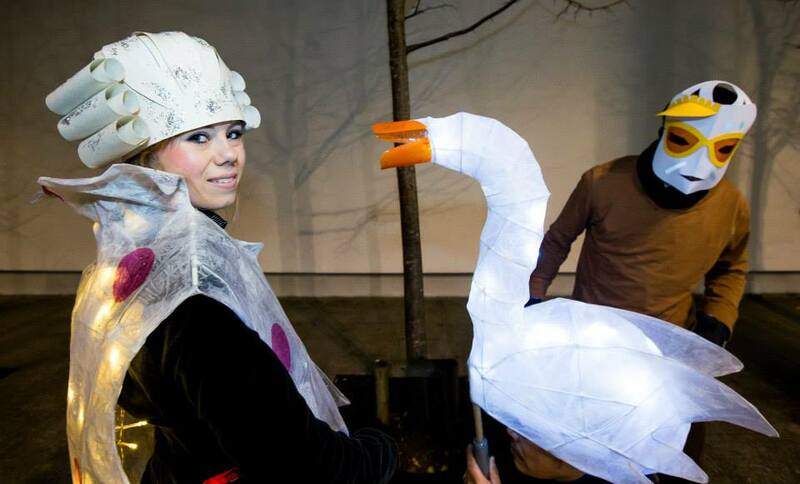 The annual UNWRAPPED programme is developed by a creative partnership between South Dublin County Council Arts Office and Corporate Services Department; South Dublin Libraries; Tallaght Community Arts; Alternative Entertainment; Contact Studio; Civic Theatre, Tallaght; RUA RED South Dublin Arts Centre and South Dublin County Music Education Partnership. It is supported by the Arts Council, the Square Shopping Centre and Monastery Music.